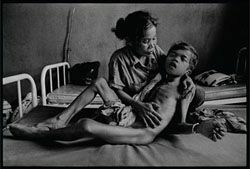 James Nachtwey caught this poignant image of a 12 year old boy cradled in his mother's arms in July 2008. The boy who had been a normal and healthy 12 year old, suddenly developed TB meningitis and went into a coma. He died three weeks after the photo was taken. The Cambodian Health Committee, with support from the Aeras Global TB Vaccine Foundation, initiated a cross sectional epidemiology study in Svay Rieng Province, Cambodia at the beginning of July. This six month study will enroll up to 1,000 infants and children less than five years old. The primary objective of the study is to estimate the prevalence of tuberculosis among BCG-vaccinated children in two operational districts of Svay Rieng Province. The study will help guide the national TB program in Cambodia towards achieving adequate treatment of TB in children while testing the optimal diagnostic approach to determine whether or not a child has TB. The focus on diagnosis of TB in children will enhance care of all children with TB and the rapid detection of disease so that children can access rapid care.